The Swiss get it right. They are passionate about hiking in nature (think exercise, “oxygenation” and spiritual renewal). But they don’t stop there. These lofty values can easily be combined with gastronomic regional dining (think savoring of the authentic local cuisine). Now I know that your first thoughts may be calories since many Swiss local specialties are not really “light”. However, that’s the beauty of the annual “Sentiers gourmands” hiking and tasting program organized by the locals living in the Pre-Alps region of Les Paccots in the Canton of Fribourg: hike, taste, hike, taste, hike, taste, hike, taste. Yes, that’s 4 courses but you may also run across an alpine family hut making cheese and you will not pass that up nor the homemade jams and pastries that are dispersed throughout the region in private summer huts. After all, the family needs to be active while their Swiss cows pasture there during the summer months. It’s only the calories of the last taste on the program that may not get burned off completely, if that is a concern for you, but the outcome of the experience is amazingly healthy and loads of fun. 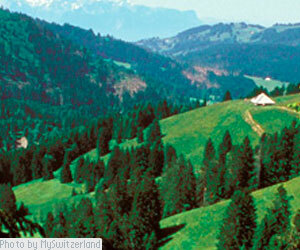 What better way to still indulge in the regional specialties of Switzerland and still stay fit? Furthermore, you will no doubt be inspired by the surrounding alpine beauty of the idyllic pastoral area and the friendliness of the locals as well as mostly Swiss hikers that you may encounter on the trails. This region is bilingual so you will find that a greeting of Bonjour or Grüezi (Guten Tag in standard German) will be appropriate. During the stops at the alpine huts for the region’s gourmet tastings, nothing works better for making friends than Bon appétit or Guten Appetit! “Sentiers gourmands” in Les Paccots (only about 30 minutes from Lausanne which is located on Lake Geneva) operates from June to September and is such a success that they had over 300,000 day hikers during last year’s season. There is also an option to overnight in an alpine stable (without the animals) spending the night smelling the hay that you sleep on. I’ve yet to go to that degree of immersion but I’ll bet the view of the stars at night is unbelievable. Les Paccots tourism offers four different levels of difficulty and timing as well as four different menus created for each hike from which to select. Last year my gal pals and I chose the Petit Gourmand trail passing the mountain lake, Lac des Joncs, that is only 1 hour long (without counting stops) and 5 km (3.1 miles). However, it took us a little longer because we got to chatting and we missed some signs and ended up all over the forest and hills before we reached the last chalet restaurant which was almost at the end of their service. However, they were empathetic and served us our typical dessert of this region which is a sweet crispy meringue with double cream poured over it (think lots of calories). Just what we needed, now that the hike was finished! This year, we’re resolved to do all of the gourmet trails (plus some that are more difficult and also listed in the brochure which would require us to bring our own lunch). However, we need to warm up early in the season (and we don’t want to miss the other menus on the “Sentiers gourmands” so we were the first off the starting line on opening day June 2! Carrying extra weight from all that winter fondue we were filled with enthusiasm and chose the most difficult trail, Sentier Panoramique (Panoramic usually implies “ascending” to higher altitudes; in this case 1000m to 1500m (3’281 ft. to 4‘921 ft.) of an altitude gain. It takes about 4 hours (without counting stops, so I let you do the math) and is about 13 km (8 miles). We were more careful this year about chatting so that we would not miss the signs this time. But when you get a Scot, 2 Irish (North and South), a Taiwanese, a Swiss and an American together…well, there’s just lots to say. But the views kept our eyes and cameras busy. From up there you have a splendid view of the Fribourg Alps and gorgeous Lake Geneva (Lac Léman). This is also the best time of year to enjoy the blossoming of Swiss wild flowers all over the hills and pastures. We were very lucky with the weather as it’s been extreme all spring with very hot and then very cold temperatures. We didn’t know what to expect but we checked in advance with the weather reports and the webcam for Les Paccots (below). Although it’s far from getting really hot at that altitude (and it can change at anytime), it was wonderfully sunny with just a little wind and cool enough to get our perspiring bodies up the Pre-Alps for the panorama.